Predators can strongly influence the microhabitat use and foraging behaviour of prey. In a large-scale replicated field experiment in East Gippsland, Australia, we tested the effects of reduced alien red fox (Vulpes vulpes) and alien wild dog (Canis lupus familiaris) abundance (treatment) on native bush rat (Rattus fuscipes) behaviour. Bush rats are exposed to two main guilds of predators, namely mammalian carnivores and birds of prey. Tracking rat movements using the spool-and-line technique revealed that, in treatment sites, rats used ground cover, which provides shelter from predators, less often than at unmanipulated fox and wild dog abundance (non-treatment sites). 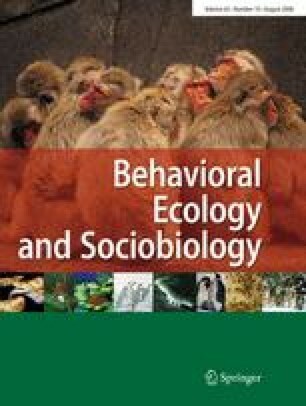 In treatment sites, rats more frequently moved on logs where they would have been exposed to hunting foxes and dogs than in non-treatment sites. Furthermore, in treatments, rats showed a preference for understorey but not in non-treatments. Hence, bush rats adapted their behaviour to removal of alien terrestrial predators. Giving-up densities (GUDs) indicated no treatment effects on the marginal feeding rate of bush rats. Interestingly, GUDs were higher in open patches than in sheltered patches, suggesting higher perceived predation risk of bush rats during foraging at low versus high cover. The lack of treatment effects on GUDs but the clear response of bush rats to cover may be explained by the impact of predators other than foxes and wild dogs. We are grateful to the DSE Victoria for providing the opportunity to link our work to their fox control program and thank A. Robley for his support. For help in the field, we thank CSIRO technical staff, especially M. J. Davies, D. J. Grice and D. A. Jones. Helpful comments on statistics were provided by C. Scherber. The manuscript was improved by comments from J. Hahne, E. Korpimäki, R. L. Thomson and two anonymous referees. Funding for A.S. was provided by the Arthur-von-Gwinner Foundation as well as family members: S., T., and A. Strauß. Work on animals was conducted under the research permit 10002322 (Victoria Department of Natural Resources and Environment) and according to CSIRO Animal Ethics Committee approval (02/03–16).